Cheeseball recipe – Cheeseboard on a budget! 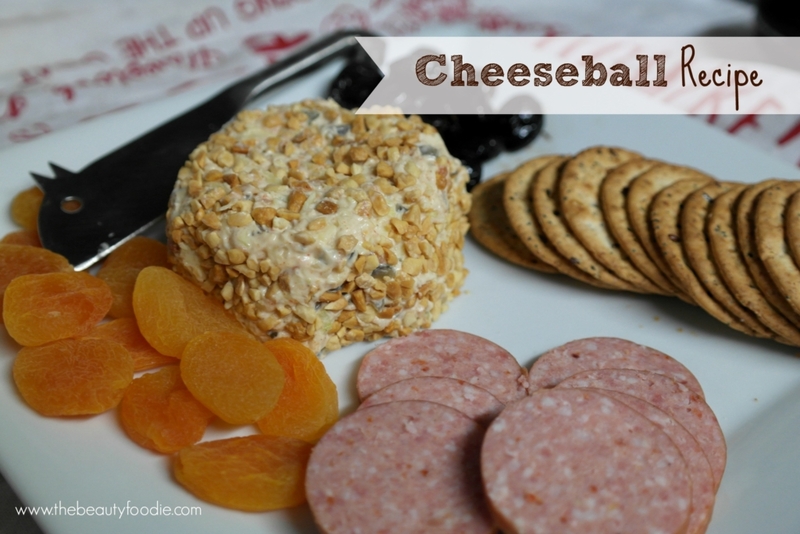 This cheeseball recipe is another one of those recipes that I’ve made on and off over a decade. It’s a recipe I actually got off my Aunty Lois. She’s a great cook and one day I asked her what her best recipe was. She paused and then said ‘my cheeseball’ – naturally I begged for the recipe and lucky she obliged! I can’t help myself, I’ve put my own spin on it over time. It’s become a great ‘go to’ recipe, particularly if we have people call in unexpectedly or at short notice as it’s something you can whip up without too much difficulty for nibbles: I always have cream cheese in the fridge and some salami (that’s a staple in my son’s lunchbox). Note, in these situations I freeze the ball instead of chilling it in the fridge to speed things up. Well, we’ve been on a reduced income since I started my new job and subsequently now work part-time, so frankly, pulling out an extravagant cheeseboard groaning with a stinky Kikorangi blue, vintage cheddar, double cream brie, cumin gouda, stuffed baby peppers and a selection of gourmet deli meats is no longer in my budget. That’s a bit of a bugger because a cheeseboard, as odd as this probably sounds for someone who loves cooking, is one of my favourite things to make, as well as eat, noting it’s not particularly conducive to being Weight Watchers friendly at the moment! Anyway, since we’ve been on a reduced income I’ve totes ditched the cheeseboard and, instead, pulled out this old school favourite cheeseball recipe a few times as a ‘nibbley dish’. It always lands well with the punters and you can serve it up with any cracker, or even a nice loaf of ciabatta, meats, anything goes. 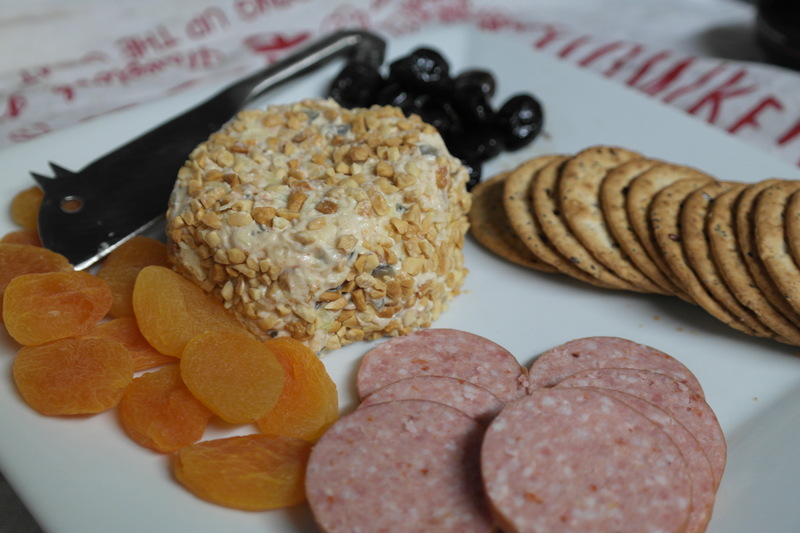 I love it on dried apricots tucked into a slice of salami, but I’m a bit random like that. On that note, there’s a heap of ways you can variate this recipe, be sure to check out the notes at the bottom of the recipe below. Lastly, as the recipe below makes two balls (snigger… I’m so smutty and immature) I often keep one in the fridge (not rolled in nuts) and then stuff it into chicken breasts a few days later. I wrap the breasts in streaky bacon, pan fry them till they are golden on both sides, then bake them until the chicken is cooked. This is next level stuffed chicken breast – I promise. Mix all ingredients EXCEPT the nuts together. Roll into two balls (or two logs) with wet hands. Place on a plate lined with baking paper and chill in the fridge for an hour. You can do loads of variations on this... I've added half a cup of cheese and half a cup of crumbed feta before. Sometimes I add a tablespoon of finely chopped herbs (parsley or chives). You can add a couple of tablespoons of finely chopped crispy bacon. Cut back on the tomato sauce and the sweet chilli/chipotle and add the equivalent mixture of crushed pineapple. As for the nuts: I've rolled the cheese ball in chopped nuts with a tablespoon of dukkah mixed in: AH-MAZING. You get the idea!